The Best Way to Connect With the Affluent Customers You Want – Infinity Marketing – The Small Business Marketing Specialists! Finding the target market that fits you best may take a little work. Â So here is a some help from, Dan S. Kennedy,Â to help you figure out just who your target market is! In his book No B.S. Marketing to the Affluent, business coach and consultant Dan S. Kennedy shows you how to re-position your business, practice, or sales career so you can learn how to attract customers for whom price is not a determining factor. 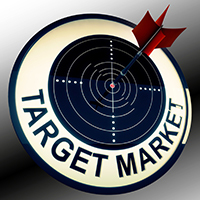 In this edited excerpt, the author tells you exactly how you can find the target markets you’re seeking. 1. Decide exactly who you want as a customerâ€”notably, deciding on the level of income, net worth, overall affluence, lifestyle and ambitions, aspirations, interests, and attitudes about spending you want them to have. 2. Be sure you’ve crafted products, services, a business, its positioningâ€”everythingâ€”for that consumer. 3. Go to those consumers where they are. That third point is succinct, but it’s often far beyond most business ownersâ€™ comprehension. Most business owners act as if they’re trees with deep roots, at the mercy of whatever favorable or unfavorable environment exists and evolves around them. But today, consumers, especially affluent consumers, can be found, identified, effectively communicated with, attracted, and sold to at any distance, near or far. A lot of people ask me about finding the affluent, as if they were all residing in secret, undisclosed locations. Actually, privacy in America and many other places in the world is dead. We not only know where they live but also what theyâ€™ve been buying. For starters, there are people who’ve already gone to a great deal of trouble to spy on them, dig up data on them, monitor their buying behavior, and compile lists of them sorted by their interests and passions, by their level of affluence, by the frequency of their spending in a category, as well as by gender, age, ethnicity, marital status, home ownership, income ZIP code, and a myriad of other divisions. In mailing list lingo, these are called selects. The world of mailing lists commercially available for rent is an amazing place. You can pretty much find any kind of group of desired prospects, then drill down closer and closer to your ideal prospects within the group by these selects. When you pass through the gateway to the mailing list world, you’ll discover that tens of thousands of mail-order, retail, service, credit card, publishing, and other companies have all their lists of past and present customers, cardholders, and subscribers as well as their prospects or inquiries available for rent. For better understanding, let’s work our way through a hypothetical example. Letâ€™s assume you own a very upscale French restaurant with a good wine cellar, snooty waiters, and high pricesâ€”and you wish to go in search of affluent new customers. This happens to be an easy one, which is why I picked it. There are hundreds of list choices. For example, there’s a compiled list of yacht and private plane owners, available by state or county. There are 213,090 prospects on the list. On that list, within a 45-minute driving radius of your restaurant in Beachwood, Ohio, there will be only a small number. Letâ€™s assume there are only 200 of them. Those 200 names may be very valuable. We know to create and send them a mailing with planes and boats on the envelope, and maybe a line of copy like â€œFree Voucher for the Adventure Trip of a Lifetime Enclosed.â€ Inside, we can tell them we know they appreciate the finer things in life, appreciate new experiences, and often fly their own plane or sail their own yacht in search of them. But did they know they could take a trip to one of the finest restaurants in all of France, only a short drive from their own home? There’s also a list available of people in any ZIP code of your choice, arranged by birthday. So, in every month, there are quite a few people in reach of your restaurant having a birthday, and most people go out to dinner to celebrate. From that list, you can select only married people or people who own homes in pricey neighborhoods or people with certain incomes. A colleague of mine operates a company that does these â€œHappy Birthdayâ€ mailings for restaurants and consistently gets tremendous response and very good return on investment. Or we could get very sophisticated and merge or purge. That means taking only the names appearing on two or more lists. The duplicates. The yacht and plane ownersâ€™ list giving us only 200 names in our area might thin out to only 10 to 20 birthday names in any given month. But they’re the quadruple-perfect prospects. So instead of sending them a birthday card or letter and a coupon for a free birthday dinner, we might send them a beautifully wrapped gift box, a copy of our menu, and a fancy certificate on parchment paper. Doing this, we would spend a lot more per prospect, but we’d be spending all our money on ideal prospects. Here’s the point: If you can describe your ideal affluent customersâ€”whether ultra-affluent, affluent, mass-affluent, young, old, male, female, and so onâ€”you can go into the inventory of available lists and find them, already rounded up for you. In all cases, you can get their physical addresses. In many cases, you can also get their phone numbers and email addresses. One way or another, from one or multiple databases, it’s possible for all marketers to obtain and develop a hit list of ideal prospects. You can drill down with incredible specificity to identify and reach out only to people perfectly, precisely, and multi data-point matched with your current customer, ideal customer, or product or service offer. And you should.